Michael and Yuri might not have been like two peas in a pod, but at the end of the day, there were still brothers, and they cared for one another. Michael, deeply upset by his brother's anger towards him, tried to distract himself in his usual fashion: by throwing himself head-first into his work. 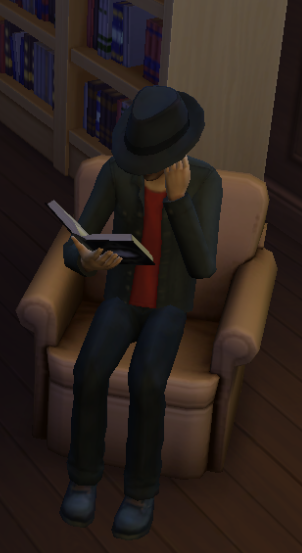 He stayed late at the station each evening, working overtime, and spent his days off in the library, doing even more research. A new suspect had been named: one Max Stapleton. Initial investigations hadn't produced enough evidence to convict him of any of the thefts, but the police remained determined that Stapleton was involved. One of Michael's main tasks now was to monitor Stapleton, and possibly catch him in the act. As Michael spent yet another day in the library, his head buried in a tome detailing the city's previous gang activities, he heard a familiar voice calling to him. "Hello, Michael! What are you doing here?" A familiar warm feeling seized Michael's heart. He slammed the book shut, and looked up into the face of Megumi Hasekura. "Hello, Megumi," he replied. "It is nice to see you. I am just doing some extra research for the case." 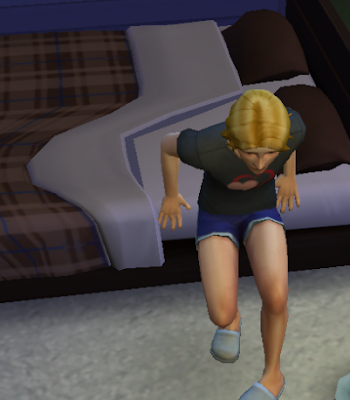 Suddenly, Michael yawned loudly, and started to shift his shoulders around. Megumi suppressed a giggle. "It must be boring you," she said jokingly. "Oh, no, not at all, "Michael told her. "In fact, I fear I may have overdone it as of late. I am quite tired." 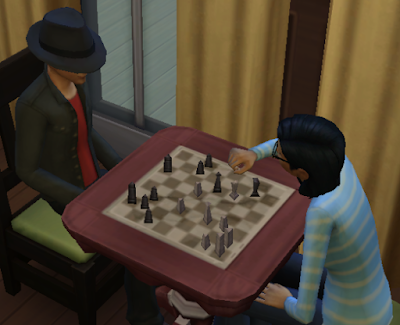 "Well," Megumi said, "we could have a quick game of chess, if you fancy a little break?" "Thank you," he answered. "That would be most enjoyable." The tiredness really was beginning to take its toll on Michael. Normally, chess games that would perplex the Grand Masters were child's play to him, but tonight, he found himself unable to concentrate. He made basic mistakes when moving the pieces, and even tried to capture pieces from his own side. Megumi, who herself was a quite a skilled player, could tell that her friend wasn't playing to his usual standard... and if anything, the loud yawns he kept emitting were a tell-tale sign. "You really have been overdoing it," she said sympathetically. "Why don't you go home, get some proper rest?" "Home is not the best place for me to be right now," Michael replied, desperately trying to stifle yet another yawn. "My brother and I have had something of a... disagreement." "Oh?" Megumi said, both intrigued and concerned. "Would you like to talk about it?" Normally, Michael liked to keep his business to himself, but Megumi truly seemed like the kind of person he could trust. Besides, she was human. Even though she was unaware of Michael being an alien, perhaps she could offer some insight into what humans usually did in these situations. "Yes," he told Megumi. "I rather think I would." As the two friends sat together in a quiet corner of the library, Michael told Megumi all about the situation with Yuri and Crystal. He didn't give any specific details about the "feelings" he'd been having, his sixth sense - it was something that even his own family sometimes struggled to understand - but he made it as clear as he could that he wasn't too keen on the young woman. Megumi listened to Michael's tale with patience and kindness, only speaking once Michael had said everything he wanted to say. "It seems to me," she said, "that you've not known this woman for very long at all. That said, neither has your brother, but he seems to truly care for her. Why not give her some more time? Get to know her a little better? Who knows? Your fears may prove completely unfounded." "Perhaps," he said. "But I am worried for my brother. If I am right, and this woman is not to be trusted, then he is going to end up hurt." "It's good that you're concerned," Megumi assured him. "It means you are a caring brother. But, at the end of the day, your brother is a grown man. He's old enough to make his own decisions... and that means that he also has to deal with the consequences. If this woman is out to hurt him, then sadly, it's a lesson he'll need to learn on his own. But I stand by what I said before: why not give her a chance?" It seemed to Michael that Megumi had a way with words. Carefully contemplating everything she had said, he nodded. "You are right, Megumi," he answered. "I need to give her a chance." He got up from his seat, smiling. "Thank you for talking with me," he said. "Now, if you will kindly excuse me, I must go and apologise to my brother." "You're welcome," Megumi replied. "And good luck." As Michael headed home, he felt a great sense of relief. Megumi was right - he hardly knew Crystal. He needed more time to get to know her. He would make it up with Yuri, apologise to Crystal herself, and see how things went before he jumped to any rash conclusions. As he approached his neighbourhood, he spotted two people stood in the street having a conversation. At first, he thought nothing of it, but as he headed towards them, his relief turned straight back into anxiety as he realised who they were. It was Crystal. Talking to Max Stapleton. He was right. He'd been right all along. Crystal wasn't to be trusted. This proved that she was a criminal... or at least, au fait with lawbreakers. As Michael studied the pair closely, Stapleton suddenly looked up and spotted him. Panic-stricken, he said something to Crystal that Michael couldn't hear. It turned out that he was telling her to run... as both he and Crystal dashed off in opposite directions. 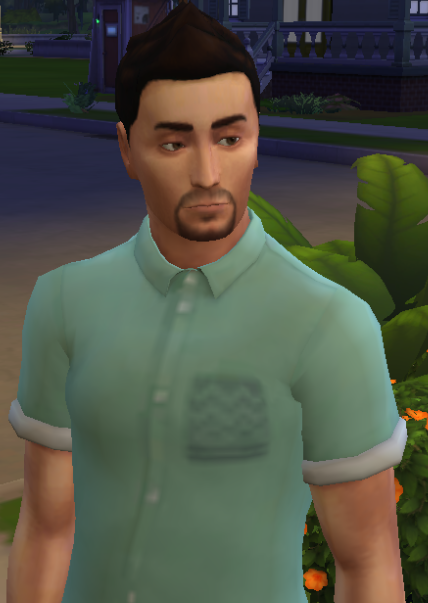 Michael chased after Stapleton, but the suspected thief turned out to be too fast for him.The detective reached into his jacket, took out his walkie-talkie, and called the station, giving Stapleton's last known location and warning them to be on the lookout. Michael then spotted Crystal heading towards a safe house. More specifically, his house. Or rather, his and Yuri's. His nerves turned to outright fear. What did that wicked woman have planned for his brother? Leaving Stapleton to his colleagues, he rushed home, and almost pulled the front door of its hinges as he stormed inside. Yuri and Crystal were sat together on the living room sofa, quietly watching TV, when Michael rushed in like a madman: his eyes wide and wild, an accusatory finger pointed straight at Crystal. "You!" Michael roared. "Out! Now!" Yuri, outraged, turned towards him. "What the hell are you doing!?" he yelled. "Crystal has done nothing wrong!" "Done nothing wrong, my backside!" Michael scoffed, using one of his father's more crass human phrases. "I just saw her speaking with a suspected criminal!" "What? Max?!" Crystal replied, alarmed. "He's one of my old school friends! I didn't know he was a criminal!" "A likely story, indeed!" Michael snapped back. "Right!" Yuri yelled, his patience tested beyond tolerance. "I've had enough of this!" "Finally!" Michael thought to himself. "He is starting to see sense!" However, his happiness turned to shock, as his younger brother suddenly grabbed him by the shoulders and pushed him out of the front door. As Michael fell stomach-first onto the pavement, Yuri stood over him, glaring down at him as though he was a piece of filth. "I'm sick of all these false accusations!" he roared. "It's not fair on poor Crystal! Until you start seeing sense, you are no longer welcome in this house!" With those words, he led Crystal back inside, and slammed the door shut. Any sadness that Michael felt was swiftly replaced by anger. As calmly as he could muster, he got to his feet, dusted himself off, and walked away. His parents would take him in... or Megumi. As for his idiot brother, he'd leave him to whatever malicious fate that criminal had planned for him. Inside the house, Yuri shook from head to toe and drew in deep breaths, barely able to keep his rage under control. Crystal, seeing that he needed some comfort, wrapped her arms around his shoulders and kissed his cheek. "Thank you, darling," she said, softly. "You're my hero." That was all Yuri needed to hear. Exhaling deeply, he immediately let go of his anger, before embracing Crystal tightly and kissing her. Smiling, Crystal took Yuri's hand, and led him towards the bedroom. Her brave hero deserved a real reward. 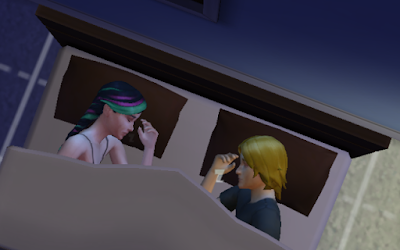 After the couple had expressed their love, Yuri watched Crystal as she slept. She looked so peaceful - so contented. No-one that sweet could possibly be a criminal. That moron he'd called a brother was wrong. Crystal loved him, and wouldn't dream of hurting him. He felt the exact same way about her. Only true love could blossom so quickly. They were going to be together forever. Feeling happier than he had ever felt before, he closed his eyes, and soon joined his lover in the arms of Morpheus. When Yuri woke up the next morning... he was alone.